Q – Is this for me? A – Anyone who struggles with weight management will find this useful. 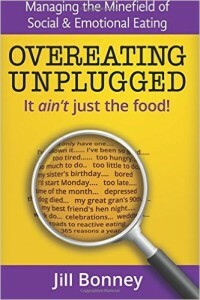 Overeating Unplugged looks at all the reasons impacting your eating behaviours, and your weight. This helps you to devise a more informed approach to your weight loss journey, and more importantly, your weight maintenance at the healthier end of the scales. Q – What is “healthy”? This said, if you have gained a lot of weight, especially round the middle, ANY reduction is a good place to begin and will make a difference. Q – Do you set weight targets? A – Other than ensuring you are not going below a healthy weight for your height, no. Should you wish to set your own weight target, Overeating Unplugged will help you assess whether it is realistic, healthy, and sustainable. Q – Will it take long, and will it last? A – We all know that most diets work, it’s what you do after that counts. Overeating Unplugged helps you discover what has tripped you up in the past, and ways to get round this and succeed in the future. Even small changes in your lifestyle, a better understanding about what motivates you, and a renewed approach, will ALL help create results that last. Q – Will I be following a particular diet? A – Overeating Unplugged helps you to choose what will work best, for you. It will help you achieve and maintain the “more calorific energy out, than in” equation, whether derived from even minimally reduced food intake, minimally changed food content, or minimally increased activity levels. Overeating Unplugged will support you in finding what best fits into your lifestyle, and will last. It draws from, and adds to, the wealth of dietary knowledge you already have, and keeps you in charge. Q – Will it be hard? A – The approach you’ll be taking to your eating patterns and weight issues will make far more sense, so it will feel a whole lot easier. It will of course need your motivation, and your commitment: knowing what you want, what being healthier and slimmer will give to you, and why you want it, is fundamental, which is why Overeating Unplugged helps you check this right from the start. Once this is sufficiently in place, your weight loss journey can be achieved in small bite sized steps, or giant leaps, so you set the pace, and you set the level of challenge. You can make sure every step of the way that you feel a sense of achievement, and increasing confidence. Q – Can I afford it? A – Only you can decide what best fits your budget, but you might ask yourself what your current health situation or lifestyle is already costing you? Whether physically, emotionally, or financially, in terms of one dieting venture after another, can you afford not to invest in yourself? Q – If I want to do the 12 week group, do I have to attend a workshop first? A – No. The workshop is designed as a stand alone “taster”. It is however a great start and gets you thinking in the right direction. Q – What are the advantages of joining a group? A – Joining a group gives time to go through the many factors in your life which affect your weight management.. It provides you with strategies to cope and work around whatever has tripped you up in the past. Moreover a group provides support over time. Because you get weighed each week, it also means that each week we can check whatever you are doing is working for you. We can make sure the new approaches are taking hold, overriding the old eating habits, and taking you toward your weight loss journey in a way that is more likely to last. As well as this you will make new friends, you will learn a lot that ripples into every area of your life, and you will have fun! Q – What do I do next? A – Email to join a workshop, a group, or for a call back to discuss. WHR is calculated by dividing your waist measurement by your hip measurement and should ideally be 0.85 for women and 1.0 for men. An easier way is to keep your waist circumference to less than half your height. – An optional weigh in! – What do you actually want? – What gets in the way and your relationship with food. – A greater understanding of how you are, and why you are, the way you are with food! – Your first Eating Behaviour Blueprint. – Strategies to cope with some of your “tripwires”. – A plan for the way forward. Each of you will have completed an in depth Eating Behaviour Questionnaire prior to attending. This is for you own use to bring your dieting and weight history, together with current lifestyle issues, into sharp focus before you arrive. We will review this at the start of the workshop. What will being healthier and slimmer DO for you? What does it mean? How might it change your life? Do you want it enough? Obvious it may sound, but understanding the difference between motivation that provides lift off, and motivation that lasts, is one hundred per cent your most fundamental starting point. It’s checking you have enough fuel for the road! Which is why it’s the most important key to successful long term weight management. A review of the factors that combined, powerfully impact your weight management. This includes your social and lifestyle circumstances, your physical wellbeing, your mindset, and an understanding of the emotions which lie beneath so much of our overeating. Jill Bonney is an experienced counsellor (B.A. Hons.) who has worked with people from all walks of life. For the last fourteen years she has specialized in weight loss and weight management, helping hundreds of people to explore their relationship with food, and transform their lives for the better. Jill is currently operating as an independent consultant from Richmond, Surrey, and the Isle of Wight.